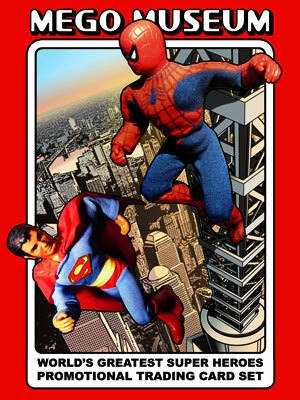 A Brief History of the World’s Greatest Super Heroes 8 Inch action figure. 1972 Outfitting Action Jackson bodies with new heads and familiar costumes, Mego creates the World’s Greatest Superheroes. The first tests were sold for Christmas at New York area 5&Dime EJ Korvetttes. The line comprised Superman, RC Batman, RM Robin and Aquaman in solid boxes. 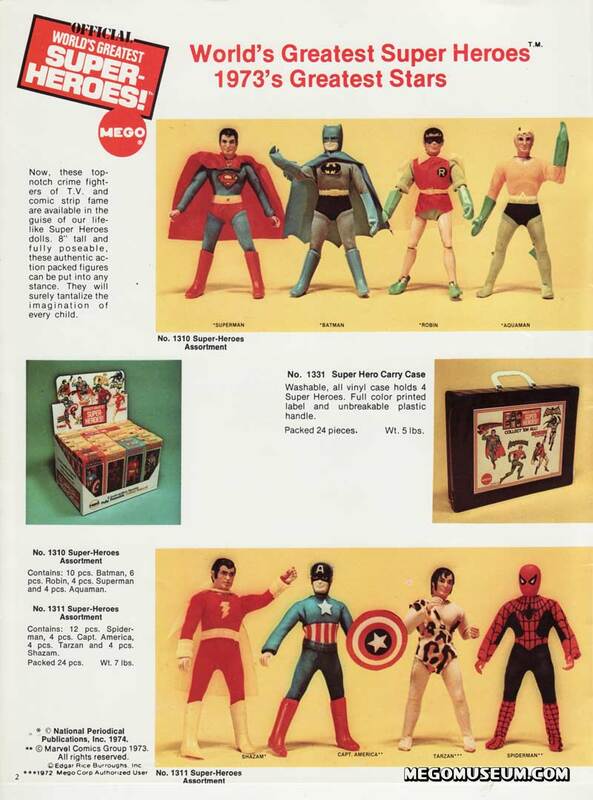 1974 A big year with the addition of the Supergals Assortment which included Supergirl, Batgirl, Wonder Woman and Catwoman and the Superfoes Assortment featuring Riddler, Mr Myx, Joker and Penguin. Shazam also arrives to give a hand. 1974 saw the release of the Batmobile, Batcopter, Cycle and Batcave Playset as well. 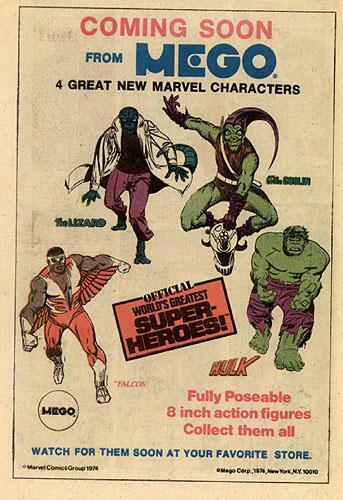 1975 Here come more Marvel heroes! Hulk, Iron Man, Lizard Falcon and Green Goblin released. Fist Fighters (Batman, Robin, Joker, Riddler) launched. 1976 O Mighty Isis arrives as well as the Fantastic Four, Thor and Conan..
1978 No New Releases. The Card artwork changes but no new heroes are released . 1979 More Heroes Dropped. Myx, the FF, Conan, Thor, Aquaman,Lizard, Green Goblin, Falcon, Supergirl and midway through the year Isis are cut from the WGSH team. down. Riddler, Batgirl and Catwoman are yanked from assortments. 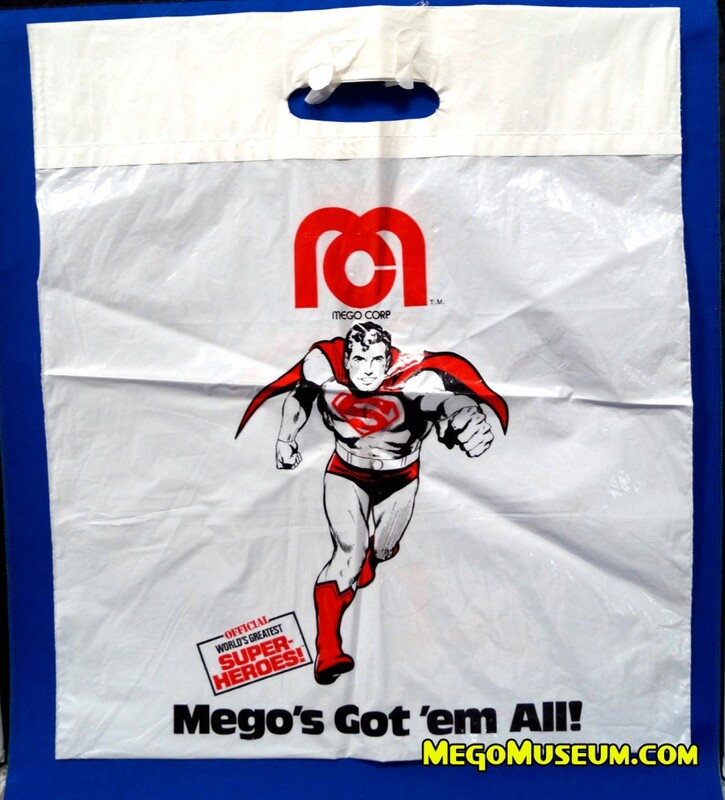 Promotional Shopping Bag Mego Sponsored for the DC Comics Super Con.